We jumped straight out of a cool, rainy spring into the heat and humidity of summer! We’re eating salads made of fresh, local produce, and grilling seasonal goodies. 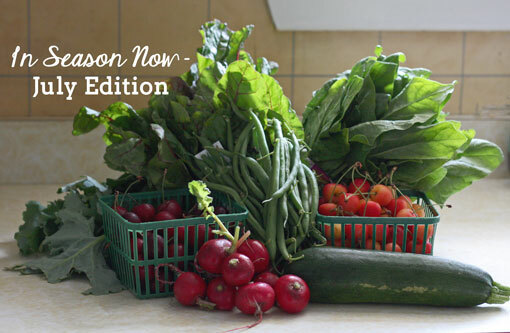 Trying to keep track of what’s in season, and what to look forward to can be a bit confusing, and since some things have a really short growing season, if you’re not at the market weekly, you may end up missing out! The first step to getting the freshest, in season food while it’s available is to check out your local farmers’ market. If you’re in Ontario this is a great listing of local markets. Things start out a little slow in May and June, when most seasonal markets open, but come July there is an amazing selection available, and that continues right on through to September and October when the seasonal markets close. Throughout the winter you can find farmers selling their wares at some year round markets like Evergreen Brickworks, St. Lawrence Market (North), and Dufferin Grove (if you live in Toronto). There are other markets open year round, so be sure to check your local area for information. The Environmental Working Group recommends that the produce noted in italics be purchased as organic according to their Dirty Dozen/Clean Fifteen list. Not all markets will specifically have organic vendors, but more and more you will see farmers noting that their crops are not sprayed. Get to know the farmers at your local market and you’ll find that they are open to your questions, and many are practicing sustainable farming. As the month progresses you’ll see even more as blueberries, stone fruits like peaches and plums, corn, and even more tomatoes make their appearance. Availability of produce varies depending on area, and things like weather that can really affect maturity and harvesting of plants. Wait until you see what August and September brings to your table! The best of the season is on the way!